Chitons make up 860 species of the Phylum mollusca. They were classfied in Class Gastropoda, but they are now placed in the Class Polyplacophora. Its English name, Chiton, comes from a Greek word chitōn. Chitōn means tunic. Like all members of the phylum Mollusca the chiton has bilateral symmetry. Chiton seems a small turtle. Shell - A muscular girdle tissue encloses Chiton like other gastropods' mantle. Shells stick on chiton's dorsal side. There are actually 8 shells which are overlaped each other under the muscular tissue. 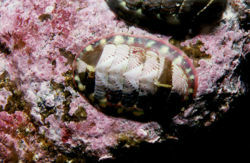 Chitons can move by their feet as other mollusks do. They accomplish support processes by the muscular girdle tissue and eight shells. They accomplish protection by rolling like a ball. Also they are very flexible so they can hide into narrow rocks. Some species can use their girdle as a net to catch food. Nervous and Sensory - The Chiton has very simple nervous system. It doesn't have brain, only has ganglia which is not developed well. Some doesn't even have ganglia. Some of chitons have specialized eyes called the aesthetes. These eyes penetrate the joint of the shell. But some use these eyes as only tactile sensory organs. Most chitons live in warm region normally on rock surfaces in the intertidal zone (between a falling tide and swelling tide). Most chitons eat herbage. In specially, they like algae. When they find algae on rock, they scrape off algae from rock by their hard radular ribbon. Their mouth is on the anterior end. Some use their anterior girdle to feed small organism. Some chitons leave their home at night to feed and return to home during the day time. This page was last modified on 3 December 2010, at 22:27.